So here's the thing about a classic pastry like a palmier: it requires what it known as lamination. No, no, not like the plastic stuff that goes over documents. I'm talking layers. Specifically, layers of dough alternating with layers of butter. You can see all sorts of snippets and examples of this on a lovely show called The Great British Bake-off (or The Great British Baking Show for we Americans) does puff pastry week with each season and it's always great to watch everything they come up with. In culinary school, laminated doughs were a lesson in patience for me. It's a very fiddly and finicky thing to keep everything just the right temperature and just the right texture in order to have it successfully bake. The idea is that you have the dough - which is cold - and the butter be the same consistency and thickness when rolling. This is often a dance between time and temperature. I was convinced that I'd never be able to do it with a vegan butter substitute, that it wouldn't ever be the right temperature or consistency to hold up like dairy butter would. Folks, meet Earth Balance. This is the single best vegan butter substitute I've come across. It acts just like butter in every single cake and pastry application I've yet to throw at it. It makes great ganache, it does a beautiful pie crust, and emulsifies in an extremely similar fashion to the real thing. It's yet to fail at a task I've put it to - and this includes laminating doughs. Trust me, I'm just as shocked as you are. Your move, America. We're out of excuses. If vegan croissants aren't soon a thing in every vegan bakery across this great nation, SO HELP ME. Dairy milk is considered a whole food because it contains every single vitamin you need to sustain life. Know why? It's breast milk. This is baby cow food, to grow baby cows up big and strong. Of course it's great for you and great for your children - provided they aren't lactose intolerant, which they probably are. The ability to drink dairy milk without consequence is an anomaly. Thanks, Reddit, for the image! Genetically, I'm half East Asian and half Ashkenazi Jewish (and yes, that's why I have such glorious curly hair). Dairy hurts my tummy. My fiance is a pan-European mutt, however, and dairy still hurts his tummy. In fact, it hurts all of his parts because he's severely lactose intolerant. I frankly can't remember the last time I've had dairy products in my home. This makes me feel only slightly less guilty about eating pork and shellfish because meat and dairy have never touched since B. and I moved in together. And let me shout it from the rooftops: I don't keep kosher by even the most-liberal of estimates. It is definitely my fault that the messiah isn't coming. I'm terrribly sorry. I'm the worst. Okay, that's enough disclaimers and tragic backstory. Let's get onto the recipe. 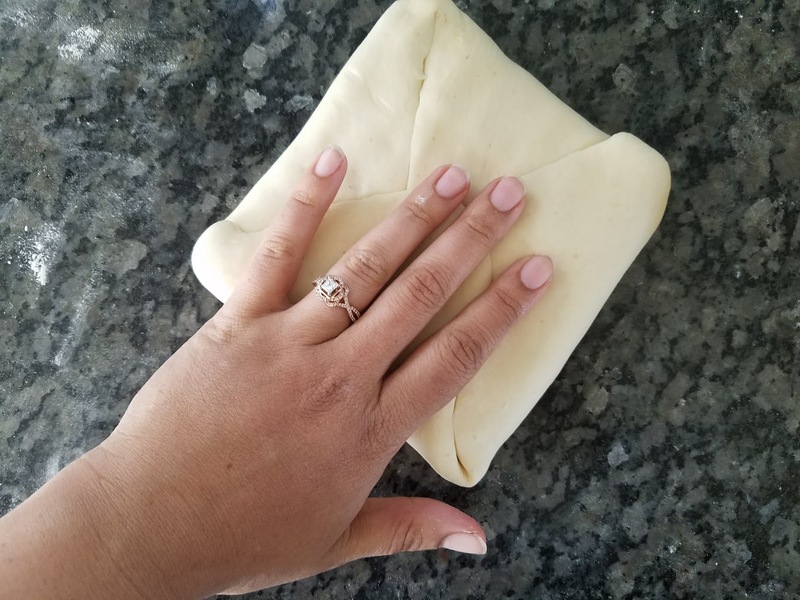 Measure your first 150 g of vegan butter substitute and press between two sheets of either parchment paper or plastic wrap to create a square. I didn't measure, but I'm pretty sure my square was about 6 inches on each side, with about half an inch of thickness to go with. Pop that in the freezer and work on your dough. Simply combine the remaining ingredients in a bowl and begin to knead with your hand. You will have to knead this to create a fair bit of gluten so that the steam from the melted "butter" will catch and make everything puff up and rise. The kneading process shouldn't take longer than five minutes; you just want to do it until the dough is rather smooth and homogenized. Wrap in plastic and let it rest for about 15 minutes in the freezer. Once your dough and butter are cool and quite firm, you're ready to work. 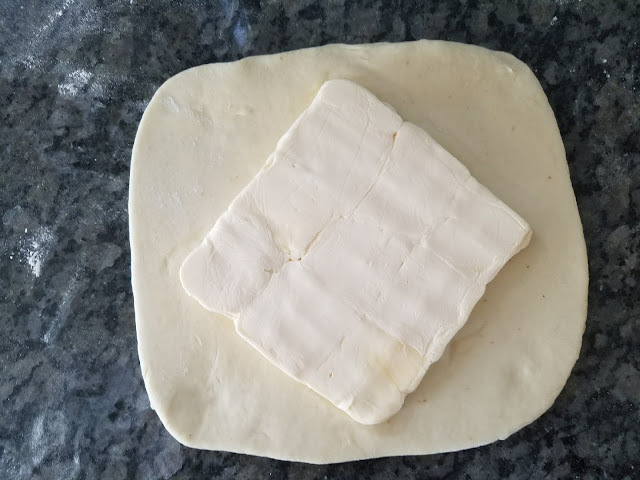 Roll your dough out to a square that, when the butter pat is placed on it, it will envelop it wholly. Like this! Easy peasy pumpkin sqeezy! Now comes the fun bit... the lamination bit! This is also called folding. There are letter folds, book folds...lots of them! You can google any tutorial on how to do folding techniques - I personally like the letter fold. 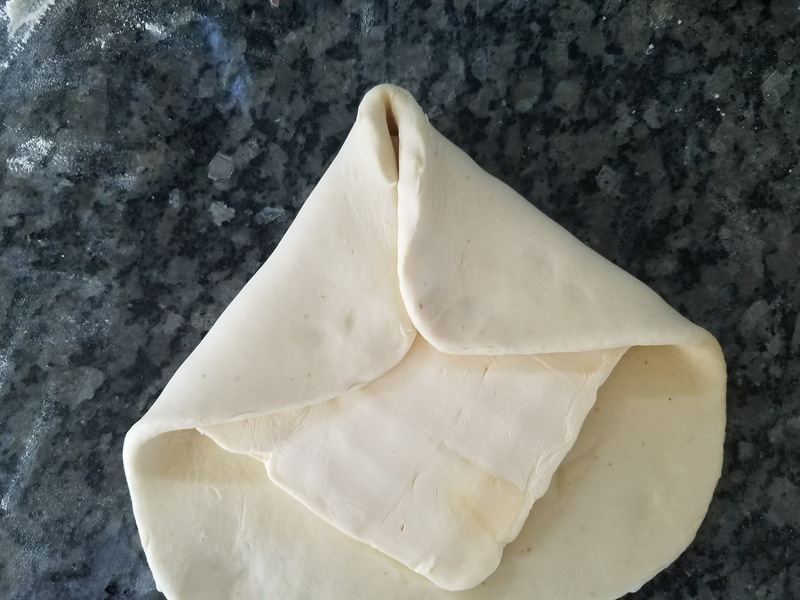 That's when you take the long rectangle of your dough and fold it over in thirds, like you'd fold a letter, and roll out! I snapped a photo of the tutorial out of my old culinary textbook from school for you to see. It really is quite simple! Now, once you've folded your dough into thirds, brush off the excess flour and roll out longways. Then, fold that now long piece into thirds which would be going the opposite way from the initial fold. Basically, you're always rotating something one turn and folding. But never go more than two turns before letting the dough rest in the freezer for at least 30 minutes. I promise you that it's worth the wait! Once you've rested the dough, roll out the dough again and do another letter fold, and yet another. 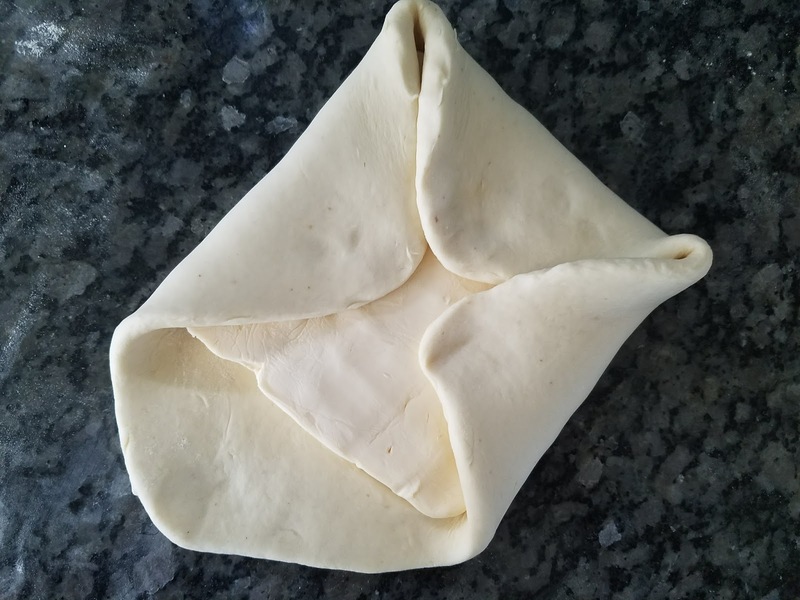 You've now done the letter fold four times, which means you have now made twelve folds, which means you have twenty-four layers of alternating 'butter' and dough. I think that's fair enough, don't you? 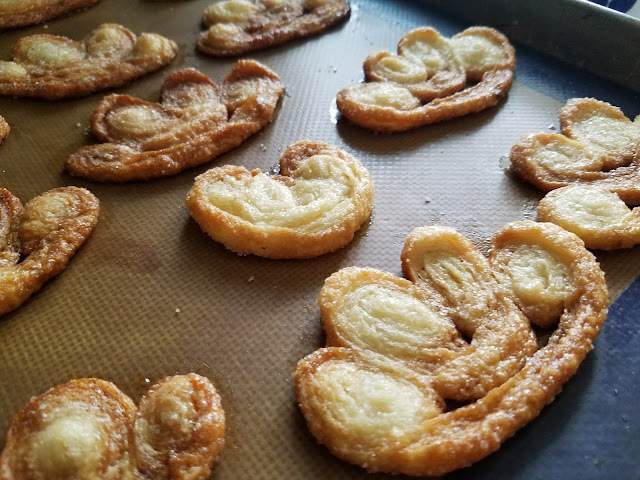 I think that you're ready to make your palmiers. So, the palmier is a special French sort of sugar cookie. Luckily, you only need about a third of your dough to make a dozen or so of these cookies, which means you can let the other two thirds hand out in the freezer until you're ready to use them again. So, cut a third of your dough and brush off your counter because you're not going to be rolling your puff dough in flour - oh, no, you'll be rolling it in SUGAR. Take your dough and roll it out to about 1/4" thickness and cut that in half. 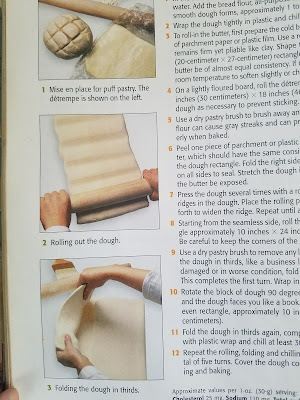 Roll up your first half of dough into a scroll long ways. This means that you have the short end facing you, and two long book-end type situations happening to make a big scroll. You then roll up your scroll on the long sides to have two scrolls meet in the middle. 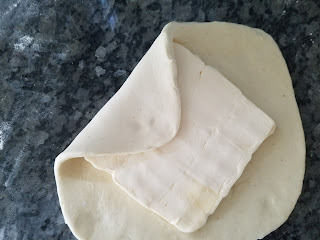 Do the same thing with your other long piece of dough, but only roll up halfway towards the middle. It's almost as if you're going to be reading it. Place your first, tightly-wound scroll in the middle of the other and then squeeze gently together to get it to stick. Turn over this entire log of scrolls so that the rolled bits are facing down and that the bottoms are facing up. Using a rather sharp knife (serrated is my knife of choice for this particular application) and quite gently slice off scroll sections of the roll. Spread out your cookies, sprinkle even more sugar on top, and then ROLL THEM FLAT! I do mean flat. Roll them quite, quite thin so that they're basically tuiles of sugar. *YOUR DOUGH MUST BE COLD. YOUR OVEN MUST BE HOT. YOUR DOUGH MUST BE RATHER COLD GOING INTO A RATHER HOT OVEN. Write it down. Put it on your fridge. Tattoo it backwards on your forehead so that when you look in the mirror, you can read it legibly. Bake for about 12 minutes or until they're golden-brown. Let them cool. You don't want to get burned with hot sugar. Besides, this way they'll become crisp the way they're supposed to! Spectacular! Happy cooking and happy eating - and if your mom is in town and you don't have a strained relationship with her, you should take some time and make them for her. You can get this ready for mother's day dinner if you start right now.